I followed the nurse down the long beige hallway and had a seat. “The doctor will be with you shortly,” she said as she turned to leave. It had been a month since my last visit. My doctor had prescribed me a statin drug to lower my cholesterol. 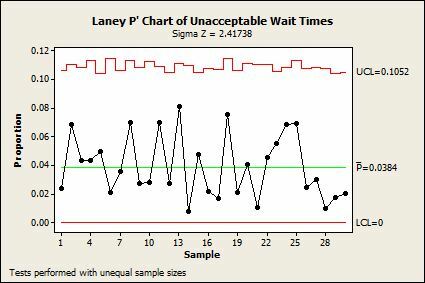 I had prescribed him a P chart to monitor his wait times. I was anxious to find out how both had worked. “Let’s start with the good news,” I said. “That’s great. But what’s the bad news?” I asked, growing just a little nervous. He fiddled with his laptop a brief moment and turned the screen toward me so that I could see all the bright red dots on his P chart. “Indeed," he said as he stroked his chin, his eyebrows raising slightly. “Yes, it varies, but I’d say we see about 400 patients here each day,” he replied. “What? No, I don’t mean the patients are defectives. A defective in this case is a wait time that is too long. The problem with a regular P chart is that it assumes the rate of defectives never changes. But in practice there is often some amount of variation due to factors like weather. That’s overdispersion,” I explained. “Oh, curse my misfortune!" he exclaimed. "That my wealth of great data is actually working against me! If only there was some way to adjust the control limits for this overdispersion so that my control chart would more accurately reflect my process." “Quite so. 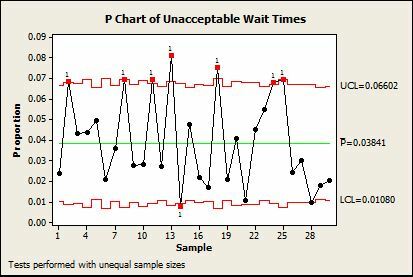 And Minitab also includes several other charts and tools that will be invaluable to practitioners like yourself in the healthcare industry, or any other industry for that matter,“ I explained. I quickly showed him that creating a Laney P’ chart was just as easy as creating a traditional P chart, you just choose Stat > Control Charts > Attributes Charts > Laney P’. An awed smile slowly spread across his previously weary face as he glanced at the results. “It’s so beautiful....” His eyes grew a little misty. I asked him if he needed a moment. “Well, actually you can know the whole story. A colleague and I had the good fortune to interview Dr. Laney about his experiences and inspirations. That interview is available for all to enjoy on the Minitab website. It’s an interesting read and it gives you some great insights into the world of control charts and the history of quality analysis."